Original G Wiley 'Fork Handles' Script 7 page script from the iconic Two Ronnies comedy sketch originally called "Annie Finkhouse" The sketch that became the most famous British comedy sketch ever recorded "Fork Handles"
7 page script from the iconic Two Ronnies comedy sketch originally called "Annie Finkhouse" The sketch that became the most famous British comedy sketch ever recorded "Fork Handles"
This is the only copy known to still exist. The original hand written script was sold by The Original Memorabilia Company for £48,500 in 2007. 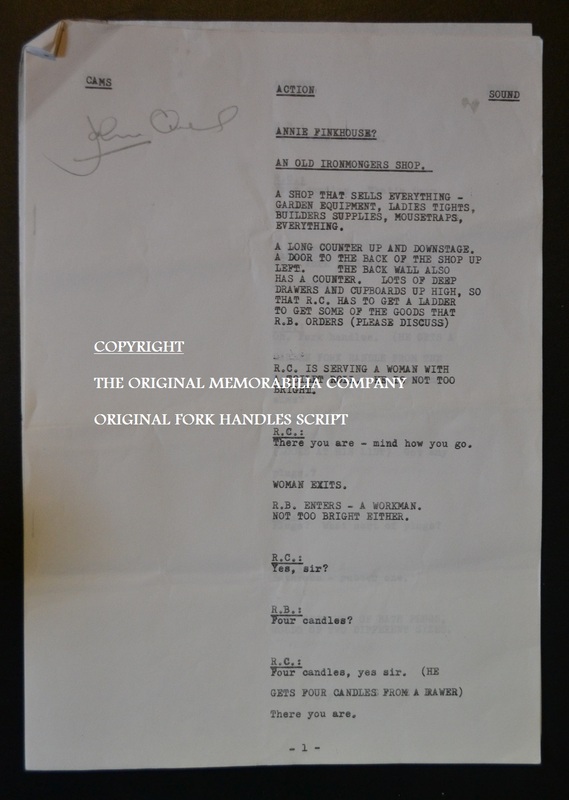 This is John Owens personal 7 page script from the iconic Two Ronnies comedy sketch originally called 'Annie Finkhouse' The sketch that became the most famous British comedy sketch ever recorded 'Fork Handles'. Written by G. Wiley, otherwise known as Ronnie Barker. John Owens was the only other actor to appear in the sketch along side The Two Ronnies playing the part of 'Mr Jones' the other shop assistant. Mr Jones came from the back of the store at the end of the sketch when Ronnie Corbett could no longer cope with the impossible Ronnie Barker. John has the last line in the sketch and reveals the sign 'Billhooks'! To accompany this sale John has written a very interesting 2 page letter that talks fondly of his experiences on The Two Ronnies up to 1987 and his part in this iconic sketch. A copy of this letter will be provided with this 38 year old script. "Annie Finkhouse" is one of a small number of scripts that John kept (thankfully!) and is the most famous Gerald Wiley (Ronnie Barker) play on words sketch of all time. This 7 page script has been personally signed by John on the front page and is John's own 'one a kind' personal copy. The hand written version of this sketch sold for £48,500 at auction in 2007. Condition of this item is excellent.It shows signs of age and has minor creasing.